… I will practice making sure I meet all of my basic needs for safety, shelter, nourishment and rest everyday. These needs are represented by the first two levels of Maslow’s Hierarchy of Needs (see image below). Attending to my basic needs will set me up to be able to work towards satisfying my psychological and self-fulfillment needs. I might need to spend some time planning towards this – a written schedule can be a big help. This week, instead of worrying about my higher-level needs for belonging, esteem and self-actualisation, I will return to the simple goals of meeting my most basic needs for survival. I will make this an act of self-care and self-respect, where I make my own physical wellbeing a priority. This week, I will focus my attentions on the most basic of self-caring acts by making sure I eat regularly, drink enough water and get enough sleep. This will set me up to cope well with whatever stressors come my way and allow me to better work towards the higher-level needs that have more personal meaning. If I need help or cooperation from others to reach this goal, then I will talk to the people around me to express my needs and request their support. 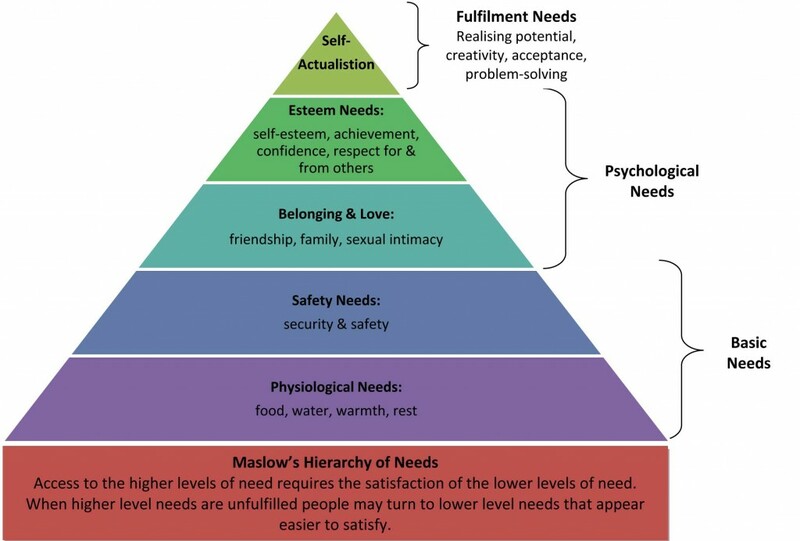 This might help me to work on fulfilling my psychological need for belonging – as working towards a common goal (such as satisfying our basic needs) can help people to connect with each other. Sometimes giving ourselves a small goal to focus on can help soothe the pressure we feel to fulfill larger and more difficult goals. Making sure I give myself what I need to be physically healthy is also one way that I can work towards improving my sense of self-esteem or self-worth. This week I send myself messages that I deserve to look after myself. Once I am familiar with creating a daily routine that meets all of my physical health needs for rest, warmth, food, shelter and movement, I will add ‘Satisfy My Basic Needs’ to my Personal Coping Kete as a way of shifting my mood in times of stress and distress. … I will practice counting out ten deep breaths twice a day as a way of sowing the seeds of mindfulness into my daily life. To do this, I will imagine my thoughts are following my breath as I breathe into my belly and count ‘in, one’ and then breathe out and count ‘out, one’, then ‘in, two… out, two’ and so on until I get ten. Each time I breathe in, I will see my thoughts moving down into my belly and each time I breathe out, I will see them being released with my breath. I will not hold on to any particular thoughts, but come back to my breath as I count in and out until I get to ten. In preparation I will schedule in two times a day so I don’t have to rely on my memory to remember to practice counting my ten breaths (such as waking up and going to bed) or set up a daily trigger to remind me to practice (such as waiting for the kettle to boil or sitting down to eat). When I am comfortable stopping to count ten breaths into my belly and ten breaths out, I will add ‘count ten breaths’ to my Personal Coping Kete as a way of coping during moments of stress and distress. By stopping to count ten breaths I will feed my body calming signals, mindfully distract my attention and give myself some space before responding to whatever it is that lies before me. The Coping Kete is taking a summer holiday and will be back in mid-January 2013 ready for another year of coping strategies. Search the archives for fresh ideas to try in the meantime and have a safe holiday period. … I will practice using mindfulness walks to shift my mood. I will start by scheduling in at least ten minutes to go for a walk outside everyday. While I walk I will focus my attention on the current moment, in which I am walking and looking around me and really noticing what is there. I will also notice myself and how my body feels to be moving around in the world. When I notice thoughts about the day returning to my mind, I will observe my thoughts briefly and then come back to being aware of my current environment and what is around me. Across the week, I might experiment with walking in different places. The environment I walk in might change the way I respond. For example, walking in the city streets might connect me with the bustle of people living their lives and walking in the park might connect me with nature. This week I will try to be aware of how different environments effect me. I will then be able to use this information to make sure I give myself time in the environments that soothe and calm me on a regular basis. Once I am comfortable going for a walk and tuning into my surroundings on a regular basis, I will add ‘Go For a Mindfulness Walk’ to my Personal Coping Kete as a strategy for dealing with stress and distress. When I notice I am feeling distressed, I will be able to use the strategy to shift myself out of the distressing moment for a little while and possibly return with a fresh perspective. … I will practice using small moments of self-care to create positive experiences in my day. Self-care is the act of caring for myself by meeting my basic needs for food and water, movement, fresh air, sunlight, stillness, and physical care. I will spend some time every morning and evening focused on a self-care activity from one of these categories. I will start out by making a list of activities I like for each kind of self-care first and then use my diary to plan which activities I will do each morning and night. I might even add to these categories if I want to, I could add ‘Connection’ or ‘Noise’ or any other kind of activity that I feel fits with my idea of what my ‘basic needs’ are. As I do each activity I will focus all my attention on the task at hand, being aware as I go that I am making a simple gesture of caring to myself. As I move through the week, I will be mindful of how I am affected by my moments of self-care so I can tell which activities work to shift my mood and whether I want to adjust them at all. Once I am comfortable purposefully doing self-care activities on a regular basis and have found some that boost my mood, I will add them to my Personal Coping Kete and use ‘A Moment of Self-Care’ as a way of nurturing and valuing myself during times of stress and distress. …I will practice stretching to distract myself from the present moment and lift my energy. Once a day I will spend a few minutes doing some basic yoga stretches. As I do them I will practice mindfully focusing my attention on the movements I am making and the way they feel in my body. I will practice letting thoughts of the day pass through my mind as I observe them and bring my mind back to my stretches. Neck Roll: Standing up, relax your shoulders, drop your head forward to rest your chin on your chest. Slowly roll your head to rest your right ear on your right shoulder, pause, return to centre then slowly roll your head to rest your left ear on your left shoulder, pause, return to centre. Repeat. Shoulder and Arm Rotation: Stretch your arms out to the side and imagine you are pushing apart two walls. Repeat three times. Keeping the arms at shoulder level, rotate the shoulders forwards and then backwards. Repeat three times. Slowly drop arms to the side and observe the sensation produced in your body. Swaying Tree pose: Standing with your feet at hip-width, reach your arms above your head, clasp your hands together, exhale and lean gently to the left. Inhale and come back to centre. Then exhale and lean to the right. Repeat. Cat Pose: Kneel on all fours with hands shoulder distance apart and your knees the same distance apart. Exhale while arching your back up and looking down at your belly. Hold for a few seconds. Inhale as you arch your back down and lift your head. Once I am familiar with doing stretches as part of my ordinary day, I will add them to my Personal Coping Kete as a way of distracting myself from distressing moments and times of stress and tension. When I notice I am feeling tense, I can take myself away from present company for a moment and practice my stretches. …I will use music to help me improve the moment and connect with positive emotion by learning to hum or whistle a song I associate with happy vibes and good energy. If no song jumps to mind automatically I will get to spend some time listening to different songs until I find one I like. Then as I move through my day, I will periodically remember to practice humming or whistling the tune while I am doing my daily tasks. This could help to insert some pleasant energy into whatever I am doing. 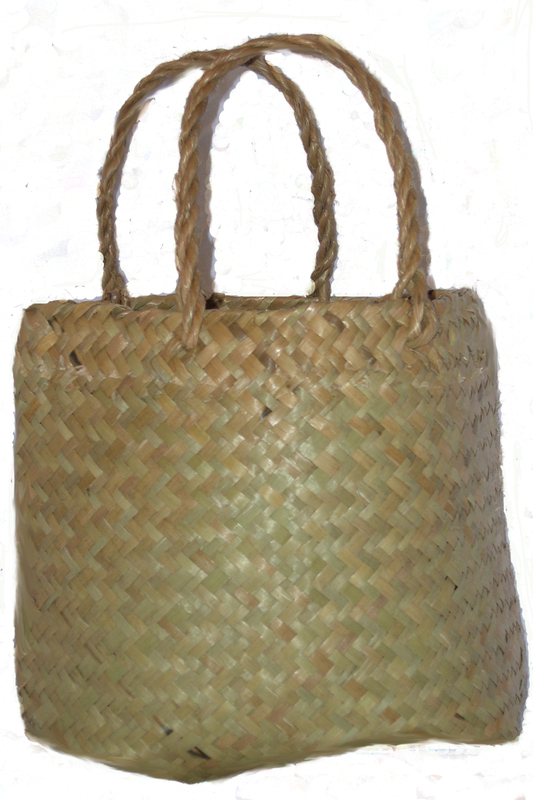 Once I am comfortable and familiar with humming or whistling my tune, I will add it to my Personal Coping Kete as a distraction and self-soothing technique for times of stress and distress. Then, when I find myself stressed or distressed, I can distract myself for a moment by trying to remember the tune and whistling/humming it. The act of humming and whistling changes the level of oxygen in the blood and can physically help to soothe negative emotions I could be feeling, so I can return to the situation later with a clearer head. Whenever I hum or whistle my tune, I will be reminded of the positive message of the song I chose and this might also help inspire me through tough moments. This is also a pretty good strategy to use if I ever feel so anxious that it gets hard to breathe. Humming or whistling a song could help to counteract that without having to focus my attention onto my breathing. …I will practicing being my own unconditionally loving parent. When I find myself falling into self-critic mode, I will say comforting things to myself. I will encourage myself on. I will have compassion for what I am going through. I will praise my strengths and remember my victories. I will attend to my self-care needs and make sure I am alright. I might imagine my ideal kind of loving parent in advance so that I am prepared with the kinds of things I might say to myself if I get distressed. This week, I take care of myself the way I want to be taken care of by others. Once I am comfortable saying caring and encouraging things to myself in everyday moments, I will add this strategy to my Personal Coping Kete as a way of soothing distress. When I encounter stress or distress I will think about how I would want my ideal loving parent to respond to me and I will respond to myself that way. …When I find myself worrying about how something will turn out, I will redirect my thoughts by visualising the situation exactly as I would like it to go. In the same way that champion athletes picture themselves successfully completing their task before they begin, I will imagine myself competently going through each motion of the task before me. I will see myself smiling and feeling good. I will imagine myself feeling strong and at ease. I will see the people around me responding positively. I will see myself at the other end of the challenge having come through it well. Each time a new worry surfaces, I will visualise myself handling it well. As I focus my mind on images of myself getting through and enjoying myself doing it, I will take slow breaths in through my nose, allowing my stomach to rise with each breath in. I will let each breath drift out through my loosely pursed lips. In this way, for a short time, I will give myself physical safety messages with the breathing and psychological safety messages with my visualisation. I will also prepare myself to handle the situation more effectively, because I will have seen what that looks like. This is much more useful than filling my head up with what the worse case scenario looks like. When I find constant worries running through my head, this visualisation could be a good way to redirect them without suppressing them. I can let each of my worries arrive so I can help them leave by imagining it being resolved effectively. This week I will feed myself visions of strengths and successes. 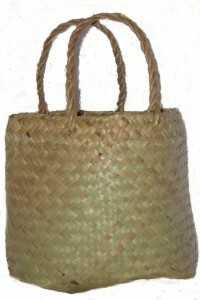 Once I am comfortable breathing and redirecting myself to visions of my strengths and successes in everyday situations, I will add it to my Personal Coping Kete for moments of stress and distress.